To search for possible locomotory adaptations involved in wax running and to evaluate the predictions of the above climbing model (Figure 8.7), we recorded the ants' climbing behavior on waxy M. hypoleuca (n = 6 stems; mean diameter of 9.2 mm) and on 10-mm diameter glass rods by comparing Crematogaster (Decacrema) msp.2 wax runners (n = 21 and 24 on glass and wax, respectively) and Crematogaster (Decacrema) msp.4 non-wax runners (n = 19 and 24 on glass and wax, respectively). Climbing ants were recorded using two synchronized digital high-speed video cameras (Redlake PCI 1000 B/W). The cameras were oriented at 90° to each other and perpendicular to the stem surface so that dorsal and lateral views could be recorded. We only analyzed continuous runs in which the ants climbed upward in the middle line of the stem in dorsal view (cutoff for lateral excursions: 15% of the stem diameter). To evaluate gait parameters and body posture, body coordinates and footfall positions were digitized and further analyzed in Matlab (The MathWorks, Inc.). Both for wax runners and non-wax runners, the gait strongly differed between runs on glass rods and on waxy Macaranga stems. 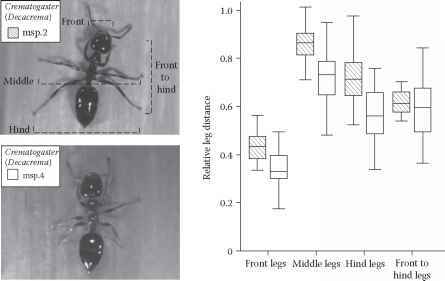 Ants climbed faster and assumed a typical tripod gait when climbing on glass (Crematogaster (Decacrema) msp.2: duty factor = 0.74, mean velocity = 11.5 mm/sec), whereas slower and "safer" gaits with more legs on the ground at any one time were used on the waxy stems (Crematogaster (Decacrema) msp.2: duty factor = 0.88, mean velocity = 2.2 mm/sec). Wax running typically involved a much greater number of steps in the front legs (Crematogaster (Decacrema) msp.2: stepping frequency = 6.6 sec-1) than in the middle and hind legs (stepping frequency of middle legs = 1.7 sec-1, of hind legs = 2.1 sec-1). The ants repeatedly put down their front legs and pulled them toward the body, apparently to achieve sufficient traction on the waxy substrate. Crematogaster (Decacrema) msp.2 wax runners not only climbed faster and almost never fell off the M. hypoleuca stems, but they also assumed a different body posture than Crematogaster (Decacrema) msp.4 non-wax runners (Figure 8.8). We measured relative leg distances between footfall positions by dividing the absolute footfall distances by the total length of the corresponding legs. Relative lateral distances (tangential to the stem) between front, middle, and hind feet were significantly greater in the Crematogaster (Decacrema) msp.2 wax runners (Figure 8.8; two-tailed U-tests; front legs, U = 145.0, P = 0.003; middle legs, U = 116.0, P < 0.001; hind legs, U = 104.0, P < 0.001). Thus, Crematogaster (Decacrema) msp.2 wax runners not only have longer legs but also spread them out more than the non-wax runners. This finding corroborates the functional significance of long legs for wax running. Despite the conspicuous sprawled posture of the middle and hind legs during wax running (Figure 8.8), the legs subtended in all cases considerably less than 0.71 times the stem diameter (median ratio of front, middle, and hind leg distance to stem diameter = 0.18, 0.42, and 0.42, respectively, with maxima = 0.24, 0.53, and 0.53, respectively). According to the prediction derived from Equation 8.2, the wider spreading of the legs in wax runners should thus not convey any mechanical advantage if leg contacts were entirely based on friction. It would also be conceivable that the wax runners' wider stance improves attachment by lowering the height h of the ant's center of gravity according to Equation 8.3. Because of the extension of leg joints, however, d can vary independently of h. Preliminary data have not shown any evidence that climbing Crematogaster (Decacrema) wax runners hold their center of gravity closer to the stem than non-wax runners (unpublished results). However, leg spreading would have a positive mechanical effect if some interlocking of the claw tips with the substrate is involved (see Section 8.3.3.3). FIGURE 8.8 Climbing kinematics of Crematogaster (Decacrema) wax runners (msp.2) and non-wax runners (msp.4) on waxy M. hypoleuca stems. The relative leg distance corresponds to the distance between footfall positions divided by the actual length of the (two) legs. Lateral distances between front, middle, and hind legs were measured perpendicular to the stem, with the distance between front and hind legs parallel to the stem axis. Each raw data point represents the mean distance of one running sequence. leads to a longer lever arm that may be mechanically advantageous as shown in Figure 8.7B. Longer legs appear to be important not only for Macaranga-inhabiting ants, but also for other insects having to cope with waxy plant surfaces. The aphid Brevicoryne brassicae was found to walk more effectively on waxy Brassica leaves than Lipaphis erysimi ; this difference was explained by the greater leg length (relative to body length) of B. brassicae .